Hello Swoon!!! I have been addicted to your website for a while, and I am proud to share with you my recently completed tiny house. I am starting up my own tiny house business called MitchCraft Tiny Homes. The house is on an 18 ft. trailer, and was designed and built ourselves. 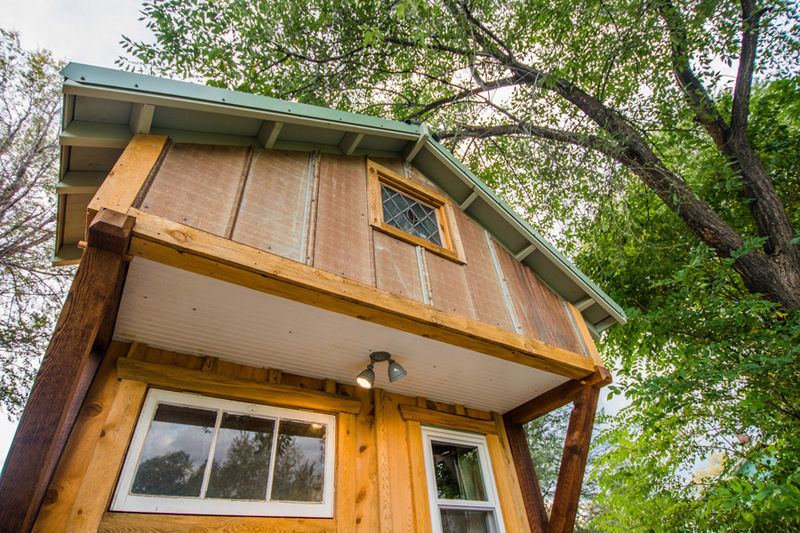 This is the first build and personal home of MitchCraft Tiny Homes. 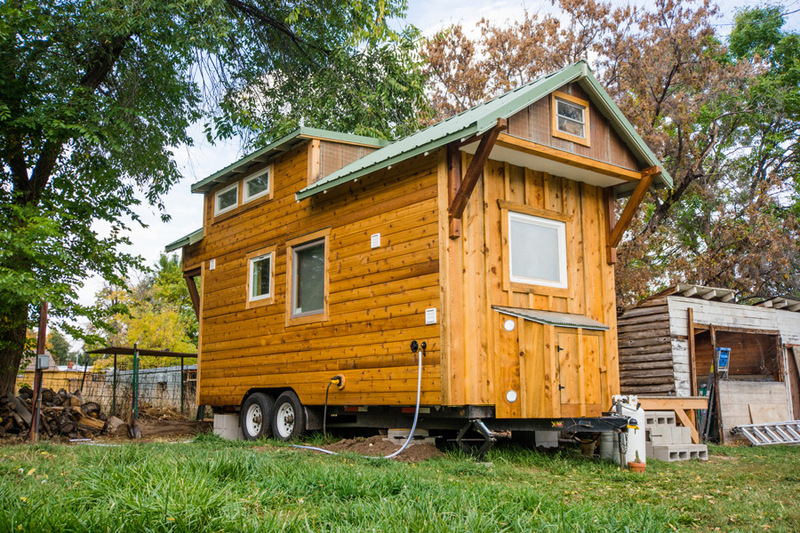 An 18 ft. tiny house on wheels built by MitchCraft Tiny Homes in Fort Collins, Colorado. How much did this build cost? This is one of my favorite builds. I like your utilization of space. Great design! I agree with you, this is an excellent use of space. I especially love the “library. My two dogs and I would love that space. I also like the stairs, not a ladder in sight. I would like a handrail. As you get older, it comes in handy. I like the environmental toilet, not sure of the wet room? Still thinking on that one. Well done guys! Woodwork on ceiling is awesome too. 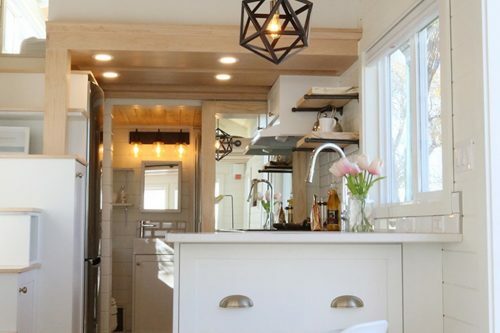 Beautiful house, both in design and construction, but the wood stove setup appears DEADLY! I was in the wood stove business for years, and this installation cannot possibly meet NFPA 211 National fire code. While it’s hard to see all the details in the photos, the following is revealed: 1) no non combustible 18″ hearth in front, 2) this Jotul 601 facsimile CANNOT possibly meet clearance to combustibles in the rear, 3) the heat shields on the stair bottom and cabinet sides APPEAR to be constructed incorrectly, without non combustible spacers, and 4), there doesn’t appear to be an outside chimney. This location would be perfect for a direct vented gas appliance but not a wood stove. A fire in a tiny home is probably more dangerous than in a full size house because it will be much closer to the dwellers, and the interval oxygen supply will be used up quicker. Last but not least, if a staircase combusts at night, how do you escape from the bedroom, I didn’t see any easy escape route outside. Once again, beautiful home and I hope I’m wrong in what this appears to be. The size and space needed for a wood stove seems inappropriate for a tiny space. Try propane or solar. Thank you, Rachel! We appreciate your time to express your concern and knowledge. 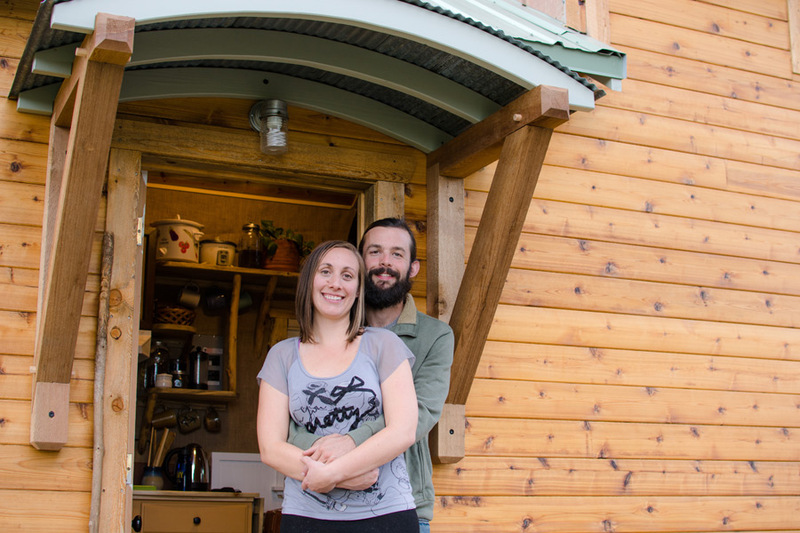 A direct vented gas appliance is a great idea for tiny homes! It’s very difficult to tell in the photos, but there is proper clearance around the stove and spacers in the shields. Regardless, the stove isn’t installed, which is why you won’t see a chimney. We love the look and feel of the wood stove in the space, but an electric heater is heating the house currently. It looks incredibly heavy to pull around. Looks too expensive for most to afford. 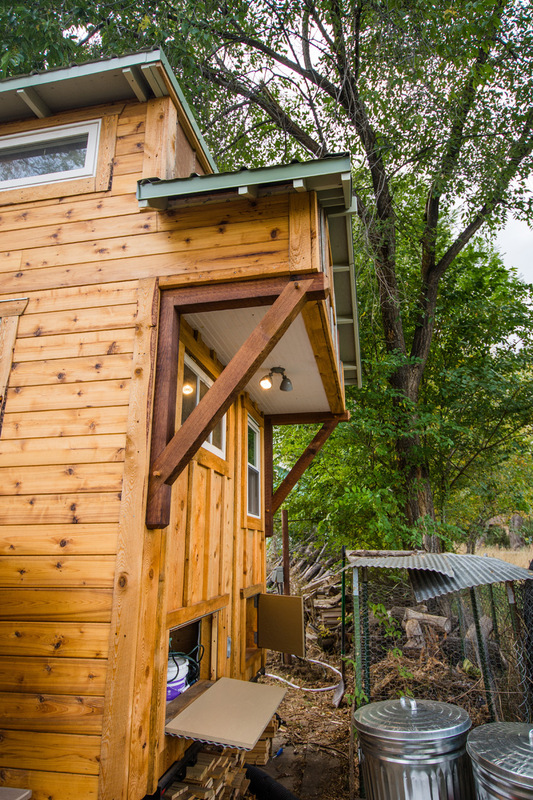 Don’t most people live in tiny houses to reduce cost? If it’s going to be more than, say, 50K, I’d be worried. There are a lot of tiny house companies out there, most of them have the same type of tiny house for sale for around that price or more. It’s lovely looking, but not really innovative enough to stand out that much. I have no doubt you will find customers. Good luck to you and your family. If you ever design a model that’s under 30K, post a picture. You have a real talent for craftsmanship and a budding sense of placement. Your house is so creatively designed and crafted and so personal and cozy and perfect.. Don’t listen to the idiots above me lookin to hate, discredit and critisize.. That is not what Tiny house living is about. Good for you for following your dreams! Enjoy your beautiful Tiny Home! It is inspiring to the max! Love your bathroom and cozy reading/chill out nook. Beautiful!!!!!!! Keep up the great work. Constructve criticism is always helpful. Beautiful house and looks well lived in. Great craftsmanship and many little details. I really like the wood on the ceiling with all the variations. I agree with Rachel on the stove danger and surely this is not the actual setup. It is obvious to any observer that there is no vent pipe, so this stove could never be lit in its current state. Even if it did somehow miraculously have a vent that didn’t run into the stairs, Rachel is right about the lack of airspace and fireproof spacers on the corrugated tin. I want to say the stove is simply a prop for the photos but knowing that the tile floor and metal appear to be attempted heat shields suggest otherwise. I guess I’ll just ask: how does the heating system in this house work? I love how you turned the design around and put a reading area/sleeping area where most put the kitchen. I much prefer the more open kitchen concept and it gives a private nook for watching tv/reading/napping! I also love that FINALLY someone showed where people actually hang up their clothes! It still looks organized, but you have easy access to it all. And all the storage up there as well! Speaking of storage, the pullouts above the fridge in the kitchen are brilliant! I wish more tiny houses utilized such things as there is always wasted space in the back of cabinets and such. I also like the size of the stairs.. not a ladder (as I just can’t do them at my age) and not stairs with steps so high you feel like you have to mountain climb them, and they don’t take up a lot of space either. As for the wood stove, well the others above me covered that, and I’m guessing you have it covered. Only change I would make is the bathroom as I would prefer a separated shower so you don’t have to deal with wet feet when you want to potty or do your hair. 🙂 All in all, love it! I think I could do those steps/ladder too. Most have stairs that are way too tall for me with a crawl into the loft at the end. These knees of mine don’t crawl anymore. This “ladder” style has reasonable height steps and they are nice and wide too—but the truth is I’d probably sleep in that little downstairs area. Agree on the wet bath. They aren’t my favorite thing. For less expense, try a sofa bed. Omit the loft and decrease the height of the building. Store a minimal wardrobe in pull-out baskets beneath a sofa bed. Right now, the wood stove is not in use. The house is currently being heated with an electric heater unit. We personally love the idea of a wood stove, but would not install without the proper safety considerations. 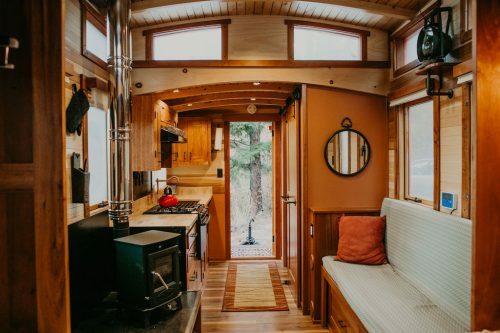 There are more suitable options for Tiny Houses, and wood-stoves would not be included in MitchCraft homes for sale without all safety codes in compliance. Love the work that you have done. KUDOS 🙂 My mom and brothers live in Ft Collins and I’m interested in seeing this in person, if possible. If you would please email me I can give you a phone I can be reached at. I would love to discuss zoning and building codes here in CO. Is it still considered a Mobile Home? So many questions, but must say I am impressive with your accomplishment, your Tiny Home. Love the layout… the extra plumbing work was definitely worth it in putting the bath and kitchen on opposite sides of the house. Agreed, the location under the stairs in NOT in any way okay for the wood stove. That corrugated steel appears to be there for a heat shield, but isn’t going to do anything the way you installed it. For anyone considering using metal as a heat shield please fur it out so that you can get air circulation begins it. Its very difficult to make tiny houses meet code, and I don’t think they should in every case, but fire safety is something you should think VERY carefully about! Love the layout & design. I can tell you put a lot of love & effort into this house, I especially like the nook, table & bathroom (that sink is too cute). But I do agree with the others regarding the stove & its placement. But I’m sure you’ll come up with a solution/alternative, you’re obviously very creative. Good luck with your new business! The nice idea about the woodstove is the central location, rather than tucked away at one end of the house. I think the spot could be made safer with spacers and perhaps more heat-dissipating shielding. But the concerns are valid. And the hinges need to be flipped on the fridge door so that it doesn’t open to the wall side. Otherwise, some very clever ideas. And extra marks for any tiny house with Calvin & Hobbes books on the shelves! 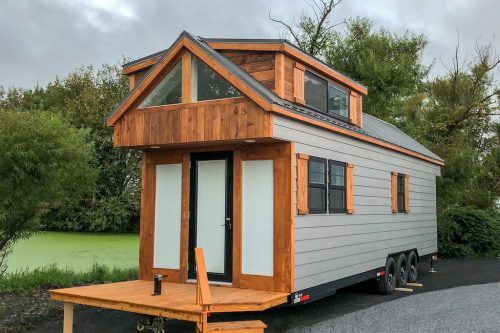 This is one of the cutest tiny homes that I have ever seen. Love the front sitting nook. Lots of personality. Love the shower room/bathroom. Kitchen is fantastic. The whole design is very romantic and masculine. I am not very well acquainted with the codes for heating. I suppose i agree with everyone about the fire hazard. But….keep going. So beautiful. Would love to know how much it cost you to put together. Or what the selling price would be. Huge fan of little homes. Love quaint sweet spots in homes. Some day i will own one. Im an artist and dont make much money. Homes this size are perfect for someone like me. All you need now is an outdoor hot tub! to go along with those stairs. Combo washer/dryer, tv? Otherwise, I’d take it! WOW, Beautiful piece of work! Lots of ideas of course to personalize to my likes, but even just as is you’ve done a great job of proving a knack for craftsmanship! I cant wait to see what you can do with a bit longer trailer to work with. this is not at all my personal style of Japanese minimalistic Small House and I still like what they have done with this Tiny House. Congrats to the designers/builders and hoping you are not having problems with your wood stove. Agree with above comments, and I would put some time in sprucing up the yard for the neighbor’s sake, and for your business. I was also wondering if there was MDF or something similar used as subfloor in the loft and is fully exposed in the bathroom. If so, even with a vent, it will not hold up to the moisture of a shower for that long. Moisture control and ventilation are very important issues in a tiny home that is often overlooked. I do like that this looks like a kitchen that is being used often and some of the vintage details. 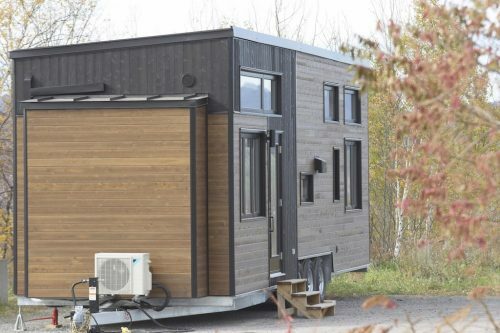 This is by far one of the most appealing tiny homes I’ve seen in years, and with only three changes, I’d love one: I’d have a marine heater instead of the wood stove, but everyone else has covered that; the light and fan/vent switches for the bathroom–NO WAY would they be inside the room, not with the shower head being right there! Talk about danger!! I’d have them outside the bathroom, seeing that I now, and for the remainder of my life, do and will live alone. Nobody to play games on me, that is. Third and last thing is that I’d want a flushing toilet, knowing that the house would be on a foundation, not to be moved by me again. Sweet, sweet little house, and I very much like that the seating area/nook can also be a bed. I’d probably sleep there far more than I ever would up in the loft, and would most likely make the loft my studio and home office (probably have a large dormer put in once the house was on its foundation, if codes permitted). In the kitchen, store one set of dishes/pans and dry goods in a lower corner carousel cabinet. Save wall space for larger windows. Storing everything away creates a more serene environment. This house has loads of charm. Mitch, your craftsmanship is superb! I love the homie feel of your tiny house! It shows you put alot of love and care into it! Congratulations on your new tiny home and your business. Wishing the best to you and your business for the future! Congratulations on your tiny home. This is the first tiny home on this site where it looks like someone lives in it. Place for clothing, kickbacks, extra sleeping, etc. It is adorable, and looks well lived in, and well loved.